What is a fan brush? A fan brush is easily recognisable by its flattened ferrule and bristles, which are spread in the shape of a fan. When should a fan brush be used? 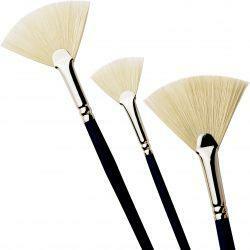 A fan brush is a versatile speciality brush, used mostly for blending broad areas of colour, smoothing and shading. Synthetic brushes are particularly suitable for paint that has been diluted, with either water or solvent, as the hairs remain strong and durable. Synthetic hairs give a much softer, less textured effect, so a synthetic fan brush is ideal for producing effects to create clouds and gentler water in artwork. Why use a Pro Arte Series C Studio Hog Fan brush? Available in sizes Small (2), Medium (4) and Large (6), the natural hairs of a Pro Arte Series C Studio Hog Fan brush are excellent for smoothing, blending, and feathering. The strokes produced by the fanned hog bristles are perfect for creating grass, trees and leaves in artwork. Particularly suitable for student painters, the Fan Brush is part of the modestly priced Pro Arte Series C Studio Hog range, which also features Round, Flat and Filbert brushes, available in sizes: 0-2-4-6-8-10-12. How should I care for my Pro Arte Series C Studio Hog Fan brush? What are the best paints to use with a Pro Arte Series C Studio Hog Fan Brush? Fan hog brushes are mostly used with oil and acrylic paints. They may also be used with thick glues, when crafting. Hog bristles do not absorb water, making them unsuitable for use with water colour paint or ink. What strokes are produced with fan brushes? I only bought this as an eraser dust brush! So can’t trally rate it for painting. Seems okay built and is comfortable to hold. A few bristles were bent. But that would probably not be an issue as was only on edge and just a couple. The hog bristle fan brush is a good brush, does what it should! Uneven spread of bristles not helped by sloppy packing for mailing which bent and distorted the bristles. Some kind of protective covering would have been advisable. Unfortunately have not long purchased these items and have not yet got around to using them. But appear to be pretty good quality at a very good price.